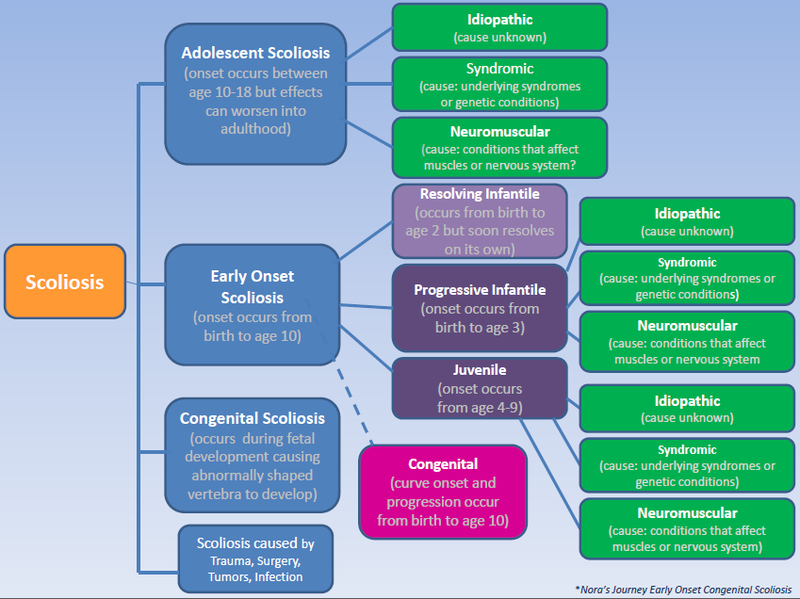 To understand early onset scoliosis, we must first define the term scoliosis. All spines have curves. Humans need these spinal curves to help the upper body maintain proper balance and alignment over the pelvis and to cushion the brain from being jarred with each step. However, when there are abnormal side-to-side curves (when viewed from the front or back) in the spinal column, we refer to this as scoliosis. Most people with scoliosis are first recognized in their teens. This is known as adolescent scoliosis. Early onset scoliosis is noticed prior to the age of 10. The reason we differentiate between early onset and adolescent scoliosis is because the children with early onset scoliosis have spines that still need to grow while most of the spinal growth in children over 10 has already occurred. Nora is under the age of 5 so her case is even more complex. The treatment for these two groups of patients will be very different. In children with early onset scoliosis, care must be taken to provide a treatment that will control the progression of deformity while also allowing the spine to grow. What is early onset scoliosis with congenital scoliosis? There are several sub-categories of early onset scoliosis that are commonly recognized. Included are idiopathic, neuromuscular, syndromic, congenital, as well as scoliosis associated with tumors, infection, prior surgery or trauma. Congenital scoliosis is associated with the abnormal formation of the spinal vertebrae themselves. This can also include the ribs which can lead to problems with lung development. Congenital scoliosis is a condition that is not technically an early onset scoliosis subset but rather its own category. This is because the age of onset is prenatal and not between 0 and 5. In this condition, one or more bones in the spine are severely malformed or missing. Spinal deformities in these patients have different treatments and prognoses based on the severity of deformation of the bone or bones, the pattern of deformity and whether the abnormal bones become more deformed as the child grows. Congenital Scoliosis is rare, affecting about 1 in 30,000 and accounts for only about 15% of all cases of Scoliosis; Early Onset Congenital is even less than that. This congenital scoliosis is present from birth and in some cases can progress very rapidly. Where the malformed vertebra exist, what types of malformations are present and how much growth potential the bones have will determine if the spine will remain fairly straight, curve only a little, or curve a lot. 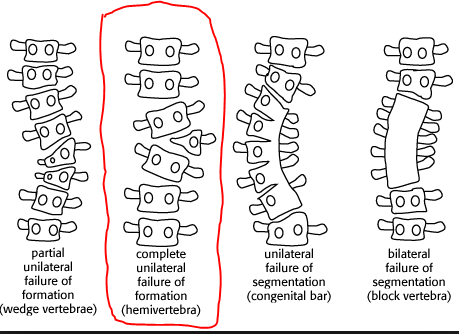 Failure of Segmentation – when the vertebra fail to separate early in development, and you have two or more vertebra “stuck” together. The most common type is called block vertebra, when two or more vertebra are fused together in between the bones. Another more serious type of segmentation error is called a congenital bar, when one side of the bone mass is fused together, but the other side is open and can grow. The third group is a combination of both of the above. Sometimes you can have both types of issues in different areas of the spine. Many times, a child WILL have a combination of different types of anomalies. One of the more serious forms of congenital scoliosis is when you have a congenital bar on one side with hemivertebra on the other side in the same location, as this curve can progress rapidly with growth. Nora has the Failure to Form classification and she not only has one vertebra that is wedged shaped, she has two. Two in a row at the T-10 and T-11 which complicates things a bit more. At the same time as the spine develops other midline structures such the bladder, kidneys, and heart are developing. As a result, you often see other anomalies along with congenital scoliosis. Some of the most common issues seen are kidney/bladder anomalies, malformations of the spinal cord and heart defects. An ultrasound of the kidneys, echocardiogram of the heart and MRI of the spinal cord are typically done after a diagnosis of congenital scoliosis is made. What is Infantile, Idiopathic, Neuromuscular and Syndromic Scoliosis? Idiopathic Scoliosis: Patients with idiopathic scoliosis have scoliosis without any of the other conditions. The cause of scoliosis in this group remains unclear. This is one of the most common forms of scoliosis in early onset scoliosis. If the child is diagnosed between birth and age 3, he/she is sub-classified as having infantile idiopathic scoliosis. If the child is diagnosed between 3 and 10, he/she is considered to have juvenile idiopathic scoliosis. Without treatment, the curvature has a very high chance of progressing and worsening . Untreated infantile idiopathic scoliosis patients will typically have a shorter life span and this is likely due to their spine curvature restricting lung development and function (breathing). Fortunately, idiopathic scoliosis seems to respond better to treatment than other forms of scoliosis and the chances of complications with treatment seem to be lower. Syndromic Scoliosis: Syndromic scoliosis is associated with specific underlying syndromes and genetic conditions. These conditions are not associated with muscles or nerves. Some of these conditions affect the bones such as osteogenesis imperfecta (brittle bone disease). Other conditions affect connective tissues. Examples of connective tissue disoprders that are associated with scoliosis are arthrogryposis, Ehlers-Danlos syndrome, or Marfan syndrome. Certain conditions are associated with spinal deformity but it is not exactly known how they affect the spine. These conditions include neurofibromatosis and a group of conditions called the mucopolysaccharidosis (Hurler Syndrome, etc). Neuromuscular Scoliosis: These are patients who develop scoliosis in association with conditions that affect their muscles or their nervous system. The nervous system can be affected centrally (in the brain or spinal cord) or peripherally. These conditions are usually associated with a higher rate of scoliosis than children without the condition. Also, the likelihood that the curves will get worse is higher and the effectiveness of non-surgical treatments such as bracing or casting are not as good. Some of the conditions that affect the muscles leading to scoliosis are muscular dystrophy, congenital myopathies, and hypotonia (generalized weak muscles). Some of the conditions that affect the central nervous system are chiari malformation, cerebral palsy, and spina bifida. Conditions that affect the peripheral nervous system include Charcot-Marie-Tooth disease and polio. Early onset scoliosis is treated for a number of reasons. The curves that these children have are often very aggressive and progress rapidly without treatment. Aside from the obvious deformity and aesthetic issues, as the curves progress in magnitude, they can deform the chest wall and can eventually cause problems with development of the lungs and other end organs. This can result in failure to gain height and weight, and in severe cases can result in decreased life expectancy. As a consequence, growth sparing treatments have been developed to try to control the progression of deformity while allowing the spine to grow. Additionally, as these children reach skeletal maturity, most will need some type of definitive fusion of the spine to prevent progression into adulthood. Larger, stiffer curves that were not managed as children are very difficult to correct and are at a significantly higher risk of neurologic injury during these surgeries. By controlling the scoliosis earlier, the final curve correction is often better and almost certainly safer. The evaluation and management of early onset scoliosis is a complex and evolving field. The care of growing spine with scoliosis is a dynamic and often unpredictable challenge. Significant advances have been made over the last decade and many more are on the horizon. As experts better understand the nature of these curves, they hope to continue to make advances that will provide better outcomes for these children.